It is likely that you are using some spreadsheets, accounting software and random tools to automate operations. But with a growing enterprise these are fast becoming inadequate. You need an integrated, all pervasive platform, which could take your precious resources off many of the regular, repetitive, administrative and yet critical operations. Microsoft Dynamics 365 Business Central will help you do just that and connect all dots – Sales, Finance, Service and Operations – ensuring that each work in tandem with each other. A seamless integration of all your functions will transform your company into a tight knit yet agile organization that is geared to create superior value for the consumer. 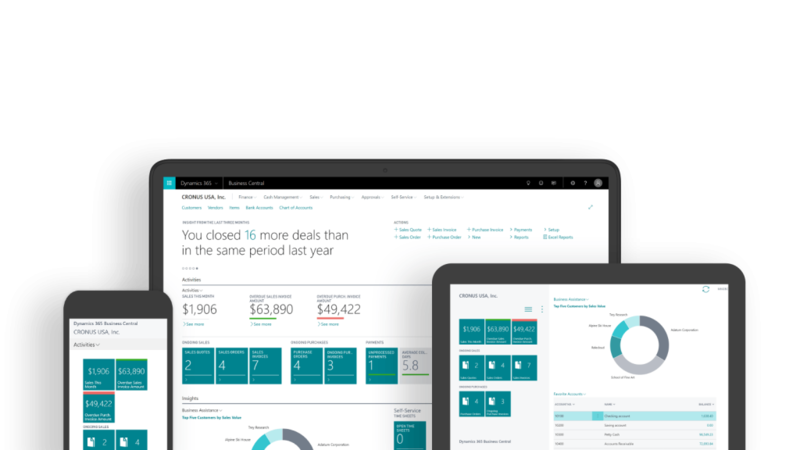 Dynamics 365 -- Business Central is a single business management solution that is easy to use and adaptable, making your business smarter and more profitable. Watch this short video to learn more about the Microsoft Dynamics 365 for Business Central and how it can help you run your business better. Microsoft Dynamics 365 – Business Central forms a digital core of your business operations. This core connects with all the departments and functions. It controls and monitors all the processes, takes decisions on your behalf, distributes work, controls information flow and creates an organization wide synergy. All customer queries, feedback and action taken are monitored, processed, stored and insights made available to relevant teams, whenever or wherever they require them. The platform acts like a virtual second-in-command that works 24X7, 365 days a year. Finance is not just about accounts but goes much beyond the creation of balance sheets and P&L statements. Budgeting, resource allocation, predictive fund requirements & availability, contingency planning, M&As etc. all require financial inputs in varied formats and degree. The Dynamics 365 – Business Central makes available all financial data accurately and in the desired formats. Since the platform monitors the financial transactions in real-time reports are updated and inputs live. This helps the leadership team take informed decisions and take them fast! Never lose a sale because of stock-out. The good news is that, to do this, you don’t need to carry huge inventories, occupying large godown space and risking product expiry. Microsoft Dynamics 365 understands your consumer behavior and will help you maintain just the right inventory levels required, with the right kind of product mix and at the right place. The platform automatically calculates stock levels, lead times, and alerts you at reorder points. The solution also suggests substitutes in case the requested items are unavailable. In short Dynamics 365 is your Man Friday! The platform prompts you for vendor payments at the right juncture. The Dynamics 365 keeps tab of credit periods of each vendor and keeps you up-to-date with payments due. This avoids penalties, helps you take advantage of cash discounts and elevates your credit rating. This helps you get better terms from the vendors, thereby enhancing your profitability. Being good with your payments also earns you a lot of goodwill in the market. As an added advantage, you will get priority treatment and will find it easy to find more partners and vendor; and even employees. The real-time insight on project status, profitability, and resource-usage metrics help you make the right decisions at the right time. This has far reaching impact on the time and quality of project execution. The dynamic timesheets help you manage, and track customer projects. The platform is also equipped with advanced job costing and reporting tools. You can develop, modify, and control budgets to ensure project profitability. You can optimize resource levels by planning capacity and sales. Customer invoicing can be tracked against planned costs on orders and quotes. Manufacturing and warehousing operations need to be synchronized for on-time delivery and cost control. The intelligent platform simultaneously monitors manufacturing cycles and inventory levels and dynamically calculates critical stock levels. Equipped with IoT capabilities, the platform automatically indents for fresh supplies, well before the inventories hit critical levels. The Outlook helps you accelerate the quote to cash process. Your able to quickly process sales-related inquiries, manage service requests, and process payments. The platform also assists in prioritizing sales leads based on their revenue potential. All customer interactions are tracked and the insights are available to guide the sales force. This not just helps in cracking a deal but to upsell, cross-sell, and leverage renewal opportunities throughout your sales cycle. The Microsoft Dynamics 365 platform takes into account all relevant factors viz. service tasks, workloads, and employee skills, before assigning resources. This reduces the chances of escalation and results in a speedy and permanent case resolution. Based on the authorization protocols the platform can be accessed from any device. Microsoft Dynamics 365 – Business Central is compatible with almost all the popular operating systems and optimized for any device viz. mobile phone, laptop or desktop. This facilitates maximum utility and ease of use – anytime and anywhere. You can engage the customer on her preferable platform; while your agents have access to key insights, enabling them resolve any customer query on the go! The Dynamics 365 – Business Central is easy to deploy and can integrate easily with your legacy systems that may or may not be Microsoft. The automated processes across Dynamics 365 applications and third-party systems work in tandem with each other to deliver superior customer experience. The integration is seamless, and requires minimal down-time. The Microsoft datacenters’ automatic encryption allows you to move and store personal data freely across systems. Information flow can be controlled and calibrated to avoid unauthorized access. Employees, partners, customers etc. are given access to information on a need to know basis. Authorizations can set at multiple levels. The package also enables audit trails to ensure security and accountability. Built-in privacy-by-design and privacy-by-default methodologies make the platform compliant with the General Data Protection Regulation (GDPR). Dynamics 365 – Business Central does not require any major capital investments, but it will be as reliable and efficient as any in-house set-up. The platform is fully scalable and flexible — SaaS model allows companies to increase or decrease the number of users as per need. Quick deployment and easy integration add to the economy, speed and efficiency of the platform.